I am crazy with loop stitch these days. You would find that my recent posts are talking about loop stitch. 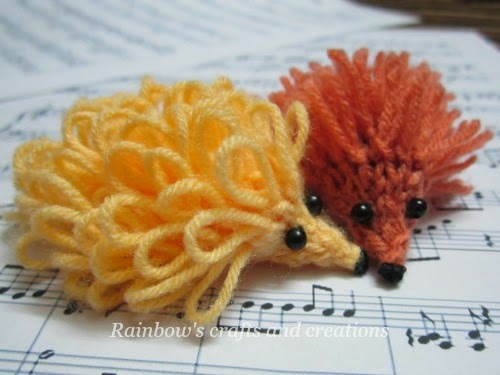 Today, I am going to show you the way I knit a mini knitted porcupine with the I-cord knitting technique and loop stitch. I-cord is a narrow tube of knitting. It is generally made using 3 - 6 stitches. Anyway, I am going to make a daring attempt. I apply the basic technique of the I-cord method to a knitted animal - a mini knitted porcupine. The number of stitches that I use in some of the rows in this knitted animal is 16 stitches!! Of course we couldn't get an I-cord effect using such a number of stitches, it will create a wide gap at the closed up point, that is why I use some scraps of yarn to stuff this knitted porcupine instead of using poly-fill material. Don't turn your work to the back every time you have finished knitting one row. Slide all the stitches along the right needle from the left to the right needle tip and then transfer this needle to your left hand. It is seem that the tail is coming from the wrong end. Actually, it is right. Pull the yarn across the back of the stitches and knit the next row. Make sure to pull the first and last stitch tightly. You can knit through the back loop for the first and last stitch of every row if you want to get a tighter and neater stitch at the closed up point. Repeat row 8 four times. Then, stuff up the body with scraps of yarn and continue knitting (refer to the photo below). row 20 : Knit one stitch and then slip this stitch back onto the left needle. Pass the next 2 stitches over the top of this stitch and off the needle and knit the first stitch again. Now, pull the yarn to tighten up and fasten off. You can trim the loops of the porcupine to get a different look. Now, weave in ends and sew the nose and eyes in place. Done. Take some unwanted yarn or scraps of yarn and simply tied in a bundle. Stuff up the cone (the body) with the bundle of yarn. It looks full now. Then, continue your knitting to row 20.